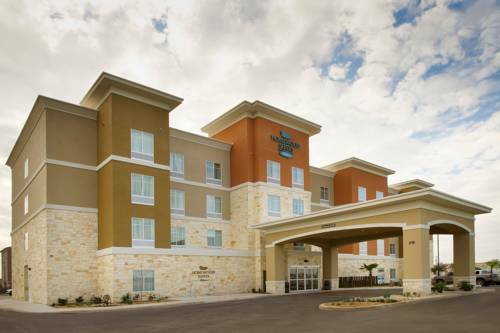 Experience warm Texas hospitality great amenities and a fantastic location just minutes from SeaWorld San Antonio and Lackland Air Force Base when you stay at the Homewood Suites by Hilton San Antonio Lackland AFB/SeaWorld TX. This extended-stay hotel in San Antonio Texas is close to numerous shops restaurants bars and entertainment and is just 12 miles from downtown San Antonio. Nearby attractions including Six Flags Fiesta Texas the Alamo and the San Antonio Riverwalk can all be easily reached from our welcoming San Antonio TX hotel. Relax in a spacious studio or one bedroom suite where you can cook meals in the fully-equipped kitchen and stay connected with complimentary WiFi at the large desk. Buy snacks and essentials at the 24-hour Suite Shop or make use of our complimentary grocery shopping service. Start each day right with a free hot full breakfast and Monday through Thursday evenings enjoy a complimentary light meal and drinks*. Stay connected with services including faxing and printing in the 24-hour business center and hold a successful event in the modern 700 sq.ft. meeting room. Make the most of your leisure time at this hotel near SeaWorld San Antonio with our fantastic amenities. Swim in the outdoor pool energize in the fitness center or on the sports court and relax on the spacious outdoor patio area complete with an outdoor kitchen and gas grills the perfect place to socialize with friends old and new. *Subject to state and local laws. Must be of legal drinking age. All reservations must be cancelled by 11:59 PM the night before arrival time unless deposit is required. If this reservation has been made electronically please cancel it electronically to avoid confusion and a no show bill. Policy is subject to change. Our customers who travel to Thailand come back to us because our food is *better than the original*. Contemporary-Mediterranean small plates and craft cocktails sparkle at Feast with Chef Stefan Bowers serving dishes that have included ground lamb kebabs ahi tuna tartar veal sweetbread jack cheese mac and sweet corn fritters. Bold Flavors Beautiful Atmosphere to share meal with your family. You can enjoy our home-cooked meals for any occasion. Let Acadiana Cafe*s friendly staff take the worry out of your next event.